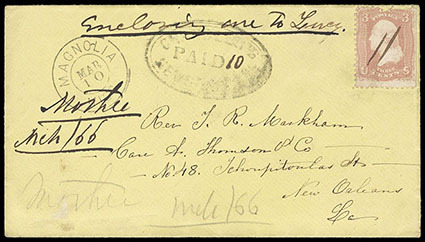 Chandler's News Express, Paid 10, oval handstamp with manuscript rate, on 1866 cover to New Orleans franked with manuscript canceled 1861, 3¢ rose (flaws), entered the mails with "Magnolia, Miss, Mar 10" cds, F.-V.F., a rare post war express. Scott No. 65 Estimate $200 - 300. 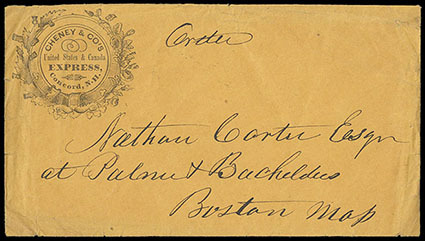 Cheney & Co's United States & Canada Express, Concord, N.H., belted floral corner card on hand carried cover to Boston, Mass., with original 1859 enclosure; minor edge wear, Very Fine. 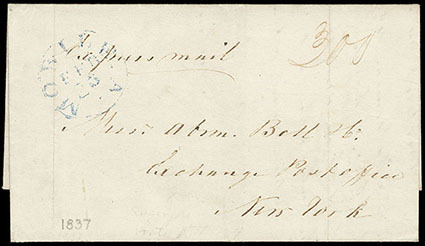 Express Mail, 1837-39, two folded letters; 1837 Mobile, Ala. to New York rated "3.00" and 1839 Louisville, Ky. to New York with paid "75" rate, F.-V.F. 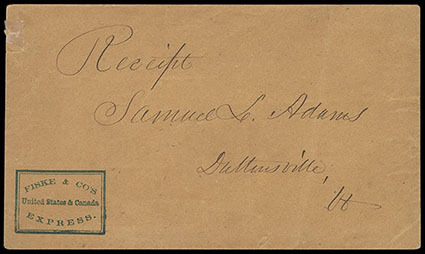 Fiske & Co. Express, United States & Canada, blue printed box corner card on 1850's cover addressed to Duttensville, Vt., Very Fine. 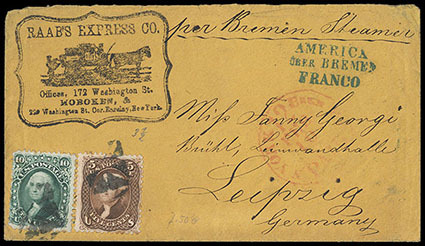 Raab's Express Co., illustrated handstamp on cover to Leipzig, Germany, franked with 1861, 10¢ green + 5¢ brown (minor tone spots) tied by cork cancels, red "New York, Brem Pkt., Paid 12, Feb 10" exchange cds and blue Bremen straight line handstamp above, Very Fine, a wonderful express and foreign usage combination. Scott No. 68+76 Estimate $5,000 - 7,500. THE UNIQUE USAGE OF THE RAAB'S EXPRESS CO. 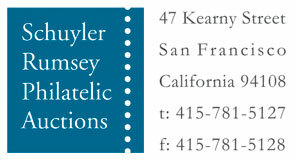 ILLUSTRATED HANDSTAMP.